Peanut butter is loved from an early childhood. This type of nuts come from South America and are much appreciated. Not only has it a superb taste, but it is rich in proteins, fats and various nutrients. Combined with olive oil and sea salt, this delicious spread is made. It can be combined with many other foods and salads. Peanut butter for weight loss has proven to be very good if eaten in limited quantities. It is also mentioned as a healthy food that reduces the risk of cardiovascular and digestive diseases. Learn why it is so good for us, what are the nutritional elements hidden in it, and that is true. Continue reading to find out more about this great food. Peanut butter contains calories in significant amounts. In 100 grams of peanut butter there is even 567 kcal. In the same amount there is a 7 percent water, 25,8g of proteins, 16g of UH, 4.7 g of sugar and 8.5g of fiber. In addition, peanut butter is full of fat, but do not let that scare you because it contains more of the good fats. The most monounsaturated and polyunsaturated, compared to saturated. It is an important source of omega 3 and omega 6 fatty acids. It is important to stress that it has no harmful trans-fats. This precious peanut is an extremely rich source of protein. Some can cause allergic reactions which are not harmless, and they can even be life-threatening. Consumption is not recommended to those people who are allergic to other types of nuts. It is low in carbohydrates, about 13-16 percent of its total weight. It has a low amount of sugar, a lot of protein, fiber and fat. This is the reason for a small glycemic index - total of 7, because of this peanut butter is suitable for people with diabetes. Biotin or vitamin H is particularly important in pregnancy. It is crucial for the metabolism, nervous and digestive systems and it is very useful. Niacin is also known as vitamin B3, which has many functions in the human body. According to research it is great heart disease. Vitamin E is a powerful antioxidant, cleanses the body of toxins and poisons, nourishes and protects the skin. It is also abundant in peanut butter so do not neglect it. Thiamine one vitamin from the B complex group. It helps the cells in the body to convert carbohydrates into energy. It is essential for the proper functioning of the heart, muscles and nervous system. Magnesium is common in drinking water and most foods. It is responsible for nearly 300 functions in the body, regulates the heart, kidney and muscle. Lack of mg in the body is accompanied by cramps, constant fatigue, weakness, pounding heart and arrhythmia. Copper is a dietary element, its importance for the proper functioning of the body is immeasurable. The lack of this mineral in the body can have a negative impact on the health of the heart and vascular system. Light peanut butter is a great source of mineral phosphorus, which is essential for growth and development and maintenance of tissues. Manganese is a mineral with many important functions, proper intake and the amount of magnesium in the body preserves heart from disease. It contains bioactive substances that are characteristic for plants. They are a rich source of antioxidants. They fight against free radicals and they are located in a thin membrane around peanuts that most people do not eat. Their importance and impact on human health has long since been confirmed. We classify them as the most important fighters against the emergence and development of cancer. Peanut butter contains a "p-coumaric" acid, which reduces the risk of stomach cancer. In addition, there is a powerful resveratrol, which reduces the possibility of developing cardiovascular disease. In small quantities present is coenzyme Q10, an important nutrient and metabolic. Beta-sitosterol is also present, which has anti-cancer properties. There are many benefits on health and the human body. Here we will show you the most notable and the most powerful effects that science has proven during the years of research. As we have mentioned, peanut butter contains a fair amount of healthy fats and protein. It in itself there is enough calories that will give you enough energy for activities. It is best to eat it in the morning in order to have enough energy throughout the day. The heart will work better if you eat at least one tablespoon of peanut butter a day. The Mediterranean diet is best for heart health because it involves consumption of foods rich in monounsaturated fats, such as peanuts. In addition to these unsaturated good fats, peanut butter is full of nutrients that promote the health of the body. The vitamin E, niacin, folate, protein and manganese. In addition, it contains resveratrol, an antioxidant that can be found in grapes and red wine. The research found that peanut butter has a very high level of antioxidants, which are essential for heart health. If you want to reduce the risk of cardiovascular and coronary heart disease, eat a handful of peanuts a day. Second option is peanut butter, at least 4 times a week one tablespoon. Resveratrol is a flavonoid first studied as an element that is found in red grapes and wine, and you can find it in this legume. Animal studies have shown that this element and the phytonutrients boost blood flow in the brain by 30 percent. At the same time reduces the risk of stroke because it relaxes the muscles and dilates blood vessels. 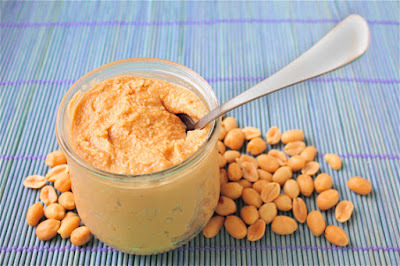 The daily recommended amount of peanut butter is 1 tablespoon, contains a very small amount of resveratrol, only 50 mkg. Yet, regular intake of these foods in the diet can be helpful. Nutrients in peanuts butter such as folic acid, phytosterols and resveratrol have the function of protection from cancer. These substances together with beta-sisterol make this sweet butter food that acts preventively against the formation and development of bowel cancer, primarily the large colon. This form of malignant disease is second to mortality, and the third most common form of cancer in the world. According to the researchers, peanut butter is responsible for reducing the risk of this disease, while spicy foods significantly increases the likelihood of disease. Consumption of peanut butter at least 2 times a week reduces the risk of disease by 58 percent in women and 27 percent in men. Why are peanuts in the diet so beneficial? Add the peanut butter in the morning pastries, cookies, pretzels and waffles, or spread it on your toast or crackers. Put a tablespoon of it in the morning smoothie. Eat a handful of these nuts with a glass of tomato juice for a snack. Mix peanut butter with a little coconut milk and you can get a tasty sauce. It is great as a sauce for salads or with fish. Decades of research have shown that a tablespoon of peanut butter daily, reduces the risk of gallstones. Science confirms by as much as 25 percent. Gall bladder disease would not exist if each of us chewed this tasty treat regularly. Take peanut butter when you are able. Eat a few sandwiches a week with this spread. Protects against Alzheimer's and cognitive decline associated with aging. Research in Chicago with people with population aged around 65 years gave very good results. It was found that foods rich in niacin prevent the occurrence of Alzheimer's disease. Also rarely comes to a sudden deterioration of psychomotor function in the elderly. Those who consumed 22 mg of this mineral daily are 70 percent more likely to avoid these diseases. The required daily amount of niacin for men is 16 mg per day, and for women 14 mg. The best way to increase the intake of these substances is eat peanut butter every day. Do peanuts increase weight or not? Although peanuts provides numerous cardio protective benefits, many avoid it unreasonably because of fear of the gaining weight. A study published in the journal "Obesity" found that such fears are not justified. People who eat peanut butter at least twice a week have a much less chance of gaining weight. It even goes so far as to say that those who never eat it will gain weight much faster. This claim was confirmed by the research carried out in Spain. Maybe peanut butter diet sounds funny, but the facts tell a different story. People who consumed it at least 2 times a week, reduced the chances of weight gain by 31 percent. Despite all the fat and salt that it contains it is good for our bodies. Peanut butter contains calories in a considerable amount. However, due to its protein and fiber when you eat it you will feel satiety for a long time. This means you will have less desire and appetite to eat bad food and unhealthy snacks. All in all, with peanut butter you will eat less food and you will feel fuller. And if you are still wondering whether the peanut butter for weight loss is good or not, you know the answer. Eat it freely, because you will not gain weight from it. If you want you can make yourself a great peanut butter in several ways. The first method is to use only peanuts that you will grind, without any additives. Grind the seeds and then use blender, adding it little by little in order to get a smooth homogeneous mixture. If the first obtained peanut butter is too dry for you we suggest second variant. It is ideal if you prefer creamier varieties that are easier to apply on bread. First bake peanut on a low flame. Then chop it, and then further grind it in a blender. In the end, add olive oil and salt. Mix for a few minutes and it is done. Depending on taste of the resulting butter, add maple syrup or honey, you can spice it up with a little cinnamon. Peanut butter and banana are a perfect combination, if you add chia seeds, it will awaken the senses. Arrange the banana and cut into slices and sprinkle with these seeds. It is perfect for a perfect breakfast. 1 cup of yogurt sugar or stevia. a little vanilla extract and half a cup of peanut butter. half a cup of cream and 250 g of chocolate. How to make the cake with peanut butter? Mash the cookies and place them in a mold and bake them for 5 minutes in the oven that you previously warmed to 180 C. Whish the eggs, add the first cheese, sugar, vanilla and peanut butter at the end. Baked crust brush with the filling and bake in the oven for one hour at 160 C. When the cake cools down put the dressing. a quarter cup of peanut butter and a spoon of honey. Whisk eggs with sugar and cocoa. In the milk, add the cream and cook for a few minutes, and pour in the eggs and stir well. Pour in a pot and cook a little bit more. Remove the top and add the vanilla, peanut butter and honey. Stir well and leave it to cool and then put it in the freezer. Where to buy peanut butter and what is the price? Peanut butter today can be bought in any store. Price varies but generally is in the range of 4-6 dollars, depending on the manufacturer and the quality of the natural product. When buying peanut butter it is necessary to read labels. Hydrogenated trans-fats and sugar are often added to it. Choose only organic ones and products that contain only peanuts, salt and possibly oil. Always choose a product in glass bottles, and note the date of manufacture. You will often see oil on the surface of the peanut butter, it is a normal process, nothing alarming. When you open the jar, use a knife or fork and mix the mixture and the components will be united again. It is not recommended for children under 3 years of age and pregnant women who otherwise prefer it, must limit the intake in consultation with a physician. During the period of breast-feeding it should not be used because it can be a potential allergens. People allergic to nuts are recommended caution in consuming it because there is a risk of allergic reactions. Read our earlier article about the healing properties of cashew nuts.